The Glengoyne is a distillery that has been producing whisky, uninterrupted and unhurried, since 1833. This philosophy on being “unhurried” is important, because it underpins the unique Glengoyne style that sets it apart from the rest – a style that is in part the result of air drying the barley without a single puff of peat smoke and distilling the new make spirit slowly at around 5 litres per minute which allows longer contact with copper and therefore optimal absorption of sulfides while accentuating esters and aldehydes. That is a big part of Glengoyne’s style, because it aims to offer super smooth single malt Scotch whisky with a clean fruity character. That, to borrow a catchcry of many chefs, “respects the ingredients”! The character of a whisky is made or altered from combining six key “ingredients” (or substances) – barley, water, yeast, copper, wood and ambient air. In addition to air dried barley and prolonged contact with copper to remove sulfides and convert esters, which is common to all Glengoyne expressions, there is something very special about The Glengoyne 21 Year Old: it has been matured for 21 long years in sherry wood. It is exceedingly rare to see whisky matured exclusively in sherry wood because it is much more expensive than, say, bourbon wood. 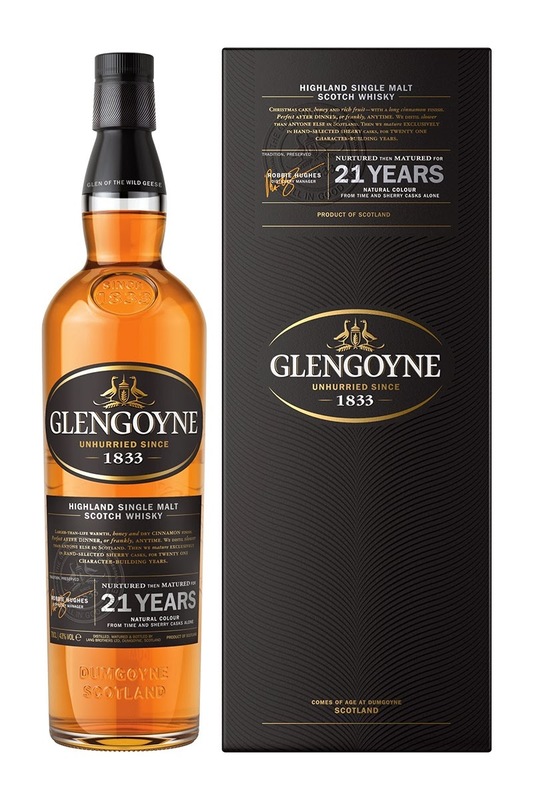 Demand for sherry casks is simply outstripping supply, which means that the Glengoyne 21 Year Old expresses the distinct Glengoyne style with a rare, and heavy, European oak and sherry twist. As a result of combining air dried barley, very clean distillate and some seriously high quality sherry wood, The Glengoyne 21 year old offers a union of flavours that is not only delicious but also unique to Glengoyne – a crisp clean Christmas cake character in which the barley and yeast are accentuated rather than lost within layers of European oak, sherry, wood spice, chocolate, coffee and powerful dense citrus notes that soften into a finish of tropical fruit, 90% cocoa chocolate and creamy honeyed porridge with a splash of expresso, cream and a brandy preserved cherry on top! Nose: The smell of the wash (barley and remnants of the fermentation process) has survived the maturation period, and this malted barley aroma is interlaced with the complex oak influence – dark chocolate orange and soft sherry notes combine into light Christmas cake with dusty nutmeg, cocoa, cracked cinnamon, fresh bitter dark green mint (forget the artificial mint, this is the natural leaf), licorice, anise seed, and, a cereal rich nuttiness and fruitiness (banana bread, walnut bread). The bouquet has a strong aroma of European oak. Curiously, shimmers of character emerge at unexpected intervals – wet bark, dark sweet ale, mocha, coffee, sweet tobacco, cream, nuts, dark toffee, cooked apples, raisin, bread and butter pudding, mild sweet roses, honey and polished wood. 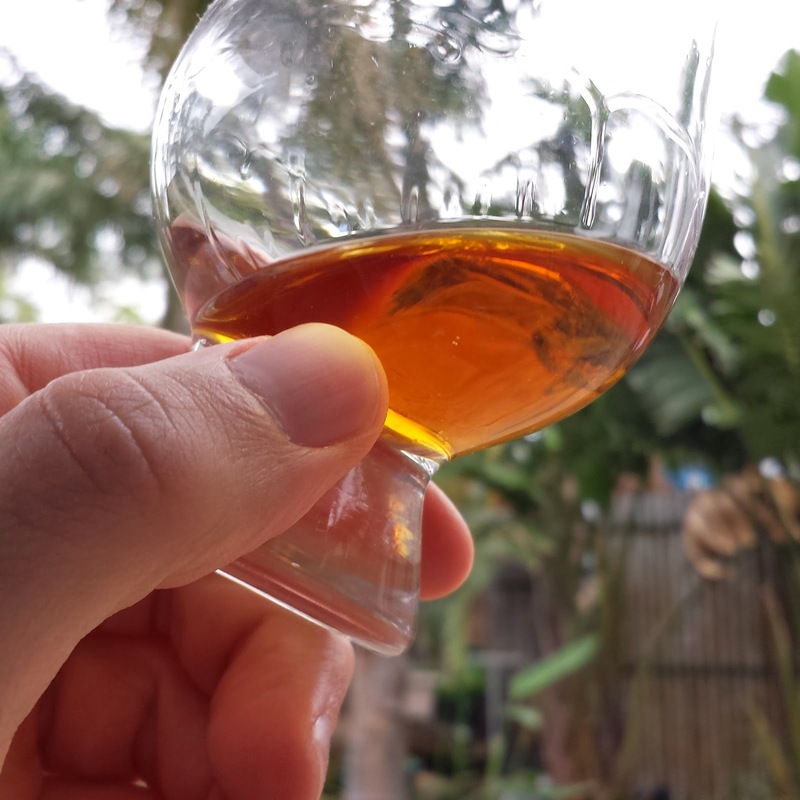 Taste: Incredibly smooth on the entry, the whisky has an initial woody bitterness that sweetens into heavier sherry notes on the mid-palate and then softens on the finish. The whisky is mouth-coating and as it fills every crevice of the palate big rounded notes of European Oak emerge with citrus rind and the sweet nip of sherry. The citrus then intensifies into heavy orange extract, rich dark chocolate laden Christmas cake, lemon rind, coffee and wood spices (cinnamon in particular). The taste of this whisky has a heavy oak influence, but the barley still gently shimmers within the fog of sherry, dark chocolate and Christmas cake. Finish: The finish itself is creamy. Honeyed oats and porridge with brandy preserved cherry lingers with dark chocolate, unsweetened coffee and soft tropical fruit (fresh pineapple and mango). I recommend this whisky only for people who enjoy exploring European oak influence. The oak has done a great, but thorough, job!